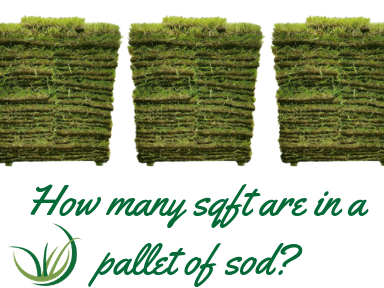 One of the many questions we are asked daily is “How many square feet are on a pallet of sod?”. A pallet of Woerner Turf’s premium sod will cover a 450sqft are. Each pallet is made up of roughly 166 slabs (or pieces). Each slab is a 16” by 24” piece. Although our direct from the farm sales team does not sell anything less than a whole pallet, our Landscape Supply Outlets do! You can find an outlet is on our locations page. A pallet of sod weighs between 1,800 to 2,300 pounds. The weight fluctuations are due to the moisture rate either by natural rain, morning dew, or irrigation. If you are planning on moving the sod, be sure that the vehicle and/or trailer can accommodate the weight of the pallet of sod. Always remember, safety first!